Since moving to Scotland four years ago I have become a bit of an outdoor enthusiast, and over the past two years the days I have spent hiking and mountaineering in the Highlands have been among my happiest. Naturally I always take my camera, however I quickly encountered a problem. To have the camera ready at all times and not have to put my backpack down and get it out every time I want to take in a great mountain vista, or a deer, or some of my friends mucking about, I used to wear it around my neck, with the strap slung across my chest and back so that the camera rests somewhere on my hip. This generally works well when just walking but I quickly ran into problems on steeper slopes. Every time it was time to scramble I either had the choice of using both of my hands and have the camera swinging around and hitting the rock, or grabbing the camera with one hand to keep it safe which only left one hand for scrambling – that did not only make it much harder, but is also not the safest way to do it. Then I came across the Capture clip by Peak Design, a product that appeared to be the solution to my problem. It found its way under the Christmas tree last year and I have had several opportunities to test it out since then. 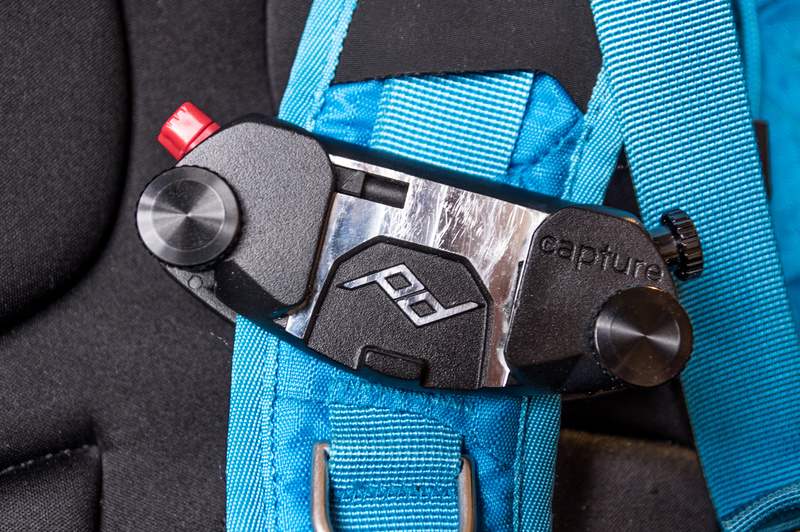 The Capture Clip started as a project on Kickstarter and quickly reached its funding target. Now in its second iteration (v2), there are two versions – the standard Capture and the Capture Pro, the latter of which I am reviewing here. While both versions can support the same weight and Capture is slightly lighter, Capture Pro is described on the website as being slightly more durable and twist resistant, is also compatible with most Manfrotto RC2 tripod heads (Capture only fits ARCA Swiss) and can be used as its own tripod head. Why someone would do that is beyond me, considering it cannot be tilted, or rotated, or do anything else, but you can if you want to. 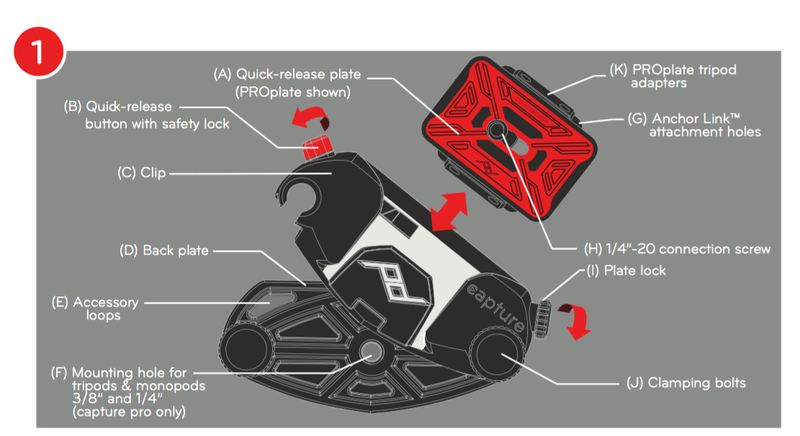 The Pro clip weighs 140g (110g for the clip, 30g for the plate), measures 10.4 cm x 5.2 cm x 2.8 cm and is claimed to be able to support over 100 kg. It has an MSRP of $79.99, can be had for £59.99 in the UK and €79.95 in Germany, and comes with a lifetime warranty by the manufacturer. 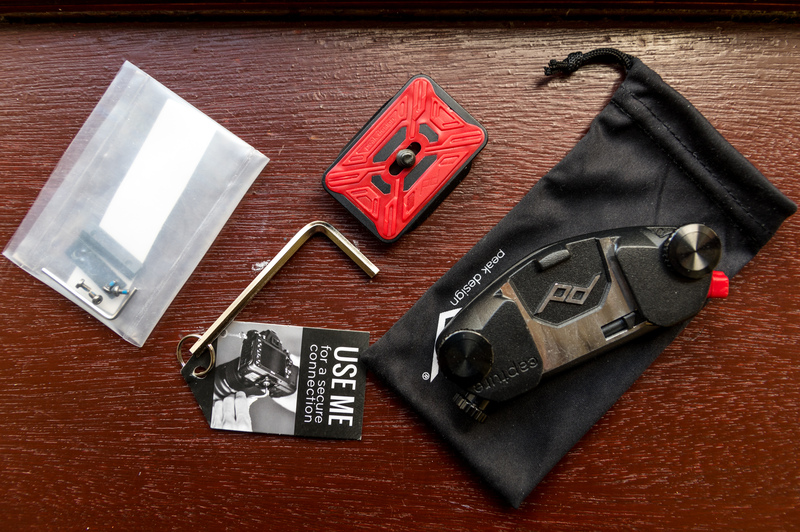 The Capture Pro comes in a little cardboard box that contains the clip itself, the camera plate, a pair of screws that measure about 1.2 cm in length, a little microfibre pouch, a small hex-wrench to attach the plate to the camera, two thin metal bars and four screws to attach them to the sides of the plate to make it RC2 compatible, and a short manual. Before I got to use my specimen properly I actually had to return it and get a new one. The plate lock screw (labelled ‘I’ in the picture below) turned out to be defective, turning it did not actually produce the intended effect of pushing the little slider against the plate and thus restricting its movement. Somehow the slider was blocked within its path, a problem I did not manage to solve myself, so I took it into the brick and mortar store where it had been purchased and after a quick inspection the shop assistant confirmed my diagnosis and handed me a new one which worked flawlessly. I took the Capture Pro on a hike in Glen Clova but the weather was so abysmal that the camera stayed in the backpack most of the time, and so it got its first proper use on a hike in Glen Coe in early February. The clip itself is made out of metal and high quality plastics, and the camera plate is all metal with a layer of rubber on top. To mount the clip you simply unscrew the screws holding the two plates together until they almost come out, then swing it open like a pair of scissors. You can then push it onto the strap/belt in question, push it back together and screw it tight. As I did this, I came across another problem – mounting the clip is pretty hard. The backpack I use (f-stop Loka) has relatively thin straps, but it took a lot of force to compress them enough to enable the screws to grab the thread in the opposing piece to allow for them to be tightened, even when completely separating the two. I would be surprised if the clip fit on the well padded straps of any proper hiking or trekking backpack. Peak Design offers a pair of longer screws that can be bought extra for the absolute bargain price of €14.99. That is not only a pretty outrageous price for a pair of bog standard screws, it is also disappointing to see that these are not included with the product considering the steep price and the fact that a large number of people online have indicated that the standard screws are too short for most backpacks. But now, after two paragraphs of complaints, let’s talk about the good bits. Once the clip was attached to my strap and the tripod plate was mounted to the camera I was ready to set out. The first trip took me and some friends up Buachaille Etive Mòr in Glen Coe. Despite the splendid weather winter conditions prevailed, and while making good use of crampons and ice axes on mixed terrain of snow, ice and rocks I was happy to have the camera out of harms way. Resting securely against my left chest it was at no danger of making contact with rocks or my ice axe. It takes only the push of a button and the camera can be pulled upwards and out of the clip for quick use. To return it you simply slide it into the clip again and once it has snapped into place it is not going anywhere. In fact, you can secure it even further by twisting the release button 90°, thus locking it. I haven’t done that yet as in order for the camera to accidentally drop out you would have to unintentionally both push the release button in all the way while simultaneously pushing the camera upwards and out of the clip, and I simply can’t see a way of that happening. So far I have carried my Pentax K3 with the Sigma 17-50 f/2.8 HSM attached, and the clip holds this 1,280g combination securely and without difficulties. From this experience with my own gear I would assume (and other users and reviewers have confirmed it) the clip could easily carry heavier combos such as a D750 with a 24-70 f/2.8 attached, albeit maybe less comfortable. Peak Design also sells a Pro Pad, a foam padded pad that the clip can be attached to to provide some cushioning between the gear and yourself, and this may be called for with heavier cameras like the one mentioned before. I still don’t see how anyone would want to carry a D5 or 1Dx II with something like a 70-200 f/2.8 though, particularly because the built-in battery grip would shift the centre of gravity further away from your chest and result in more of a pull on the strap. But with higher level APS-C cameras and the not-so-giant full frame models out there it should work fairly well. When leaning forward to tie your shoes or pick something up the lens mostly remains in its intended orientation parallel to the backpack strap, only slightly falling forward as the weight of the camera bends the strap into a bit of an S-shape. The initial reaction of anyone who sees the clip in use is probably the same – “How is this not uncomfortable?” I thought the same, but it really isn’t. Despite the substantial weight, about a minute after mounting the camera you have all but forgotten it is there; yet it is always accessible. Taking it off is a matter of seconds and can even be done one-handed. Naturally you need to be careful when taking your backpack off and putting it down as the camera is then free to swing around on the strap and hit whatever you are placing the pack on. In the beginning of the review I mentioned the plate lock screw. Once you have slid the camera into the clip, it sits securely but there is some play in between the parts. This is necessary in order to make it possible to slide the camera plate in without having to align it absolutely perfectly first. However, the sound the wiggling of the components makes as you hike along a bumpy path may annoy some people, so the plate lock screw allows for tightening the connection. On the flip side this makes it a bit more difficult to insert and remove the plate (unless you quickly unscrew the lock, of course), and I noticed that on steep slopes and bumpy paths that lead to a lot of movement and wobbling the plate lock loosens rather quickly. You screw it tight and after two minutes it is wobbly again. I also had a try attaching the Capture Pro to my belt and quickly figured out that carrying a semi-pro DSLR with a fast zoom attached is both rather uncomfortable and requires a sturdy belt. I can see a normal belt quickly getting worn out and damaged, something I’d rather not do to my nice leather belt. 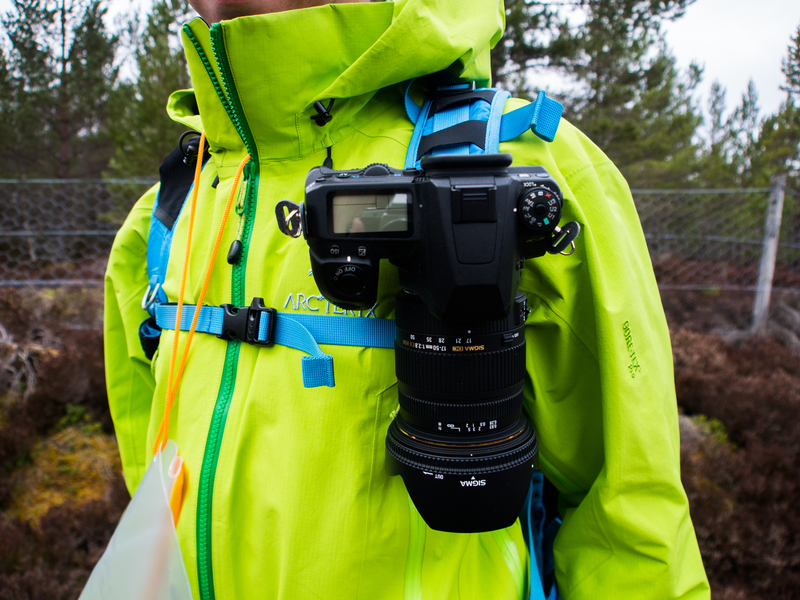 The clip can also be attached to any other kind of strap, be it a backpack’s waist strap or the strap of a messenger back, but in general I think the only way to carry a full-sized DSLR comfortably is on a backpack strap. You can find many promotional images on Peak Design‘s website showing massive full frame DSLRs dangling off belts or messenger bag straps, but these are configurations that personally I would only use with lighter, mirrorless models. In the short product description they also refer to “most Manfrotto heads”, and so do the different country specific Amazon stores. Alas, all the reviews I had consulted before my purchase simply claimed full compatibility of the Pro plate with ARCA and Manfrotto RC2. So this is clearly not Peak Design’s fault, but I was still misinformed, which is rare because I usually do my homework before buying something. And based on the wording of the quote above, I am probably not the only one. So if you are about to purchase the Capture Pro in anticipation of being able to use it with a Manfrotto tripod, make sure to check out this list of compatible heads first! As just about a month later I acquired a new, small and light carbon fibre tripod for hiking which uses an ARCA ball head, I am still able to use the camera plate as a tripod quick release plate though, which is nice. When I took the clip off after the hike another thing struck me – where it had been sitting my backpack strap was completely compressed. Obviously this is to be expected, after all the clip needs to be screwed tight to ensure a secure grip, but it still highlighted the fact that over the long term the clip can damage the strap to some extend. The material in my backpack’s strap slowly recovered to some extend, but it’s not as thick as it used to be. 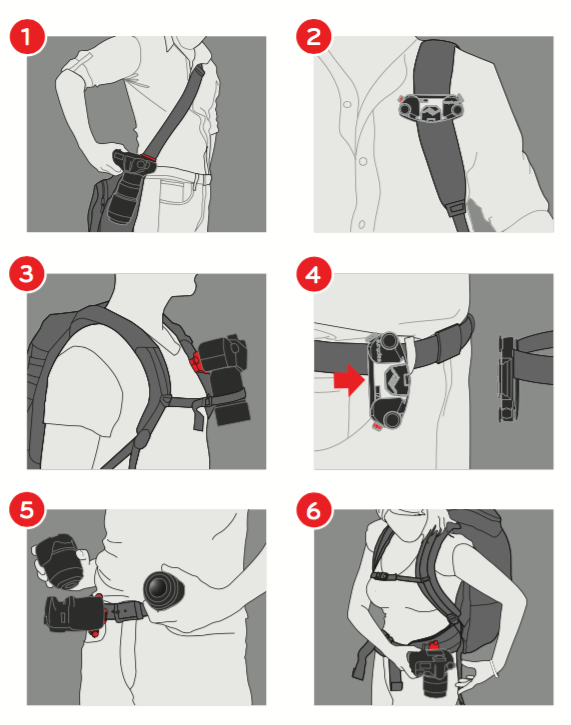 If you plan to use the Capture on a backpack, you may be well advised to find the most comfortable spot and stick with it, otherwise you might end up losing the straps’ cushioning at different points. The Peak Design Capture Pro camera clip is a versatile and innovative solution for any photographer who spends a lot of time in the outdoors. It keeps your gear secure, allows for quick access and is built to last. On the downside you have a potentially damaging long-term impact on backpack straps, the fact that the plate lock loosens on bumpy terrain, the disappointing absence of longer screws that are necessary to fit the clip on any but the slimmest backpack straps and a rather steep price. While the list of cons sounds somewhat long compared to the pros, they are all fairly minor points, and overall I am highly satisfied with my Capture clip. I am glad I have finally found a way to carry my camera securely while keeping my hands free, and will continue to put this little thing through its paces. Image 1 and 3 are copyright of Peak Design and used under Fair Use. The featured image (image 5) was kindly taken and provided by my friend Justina Lauceviciute.